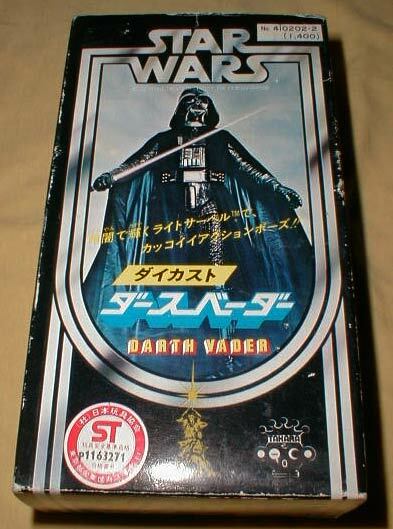 Takara Die Cast Darth Vader Figure: Here you see Takara's die-cast rendition of Star Wars villain Darth Vader. Like its C-3PO counterpart, it comes in a cardboard box that's printed with colorful graphics. Now, most people don't know it, but Darth Vader was known to be great with a crossbow. So Takara packaged this figure with a miniature plastic replica of this weapon, complete with two plastic projectiles to fire at good guys. Although you can't see it well in this photo due to its light color, this figure also came with a white lightsaber. 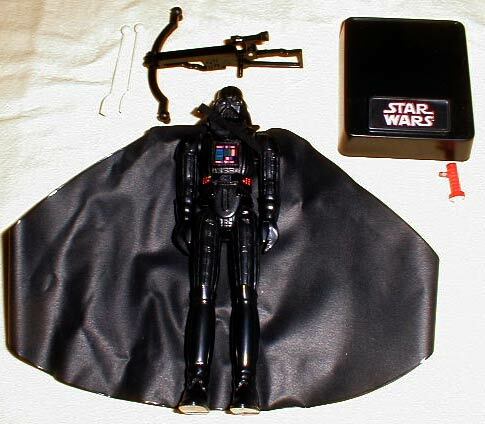 Additional accessories included a vinyl cape and a plastic display stand. Here's a close-up. As you can see, the figure is nicely detailed. But it's exaggerated; the boots and gloves in particular seem stretched out and unrealistic. I kind of like the look; there's an almost art deco quality to it.